Mika wandered up to the mountain top. She spread her wings and fluttered to the top of the tallest boulder. She didn't want to think anymore, she wanted to turn her mind off. Seeing her father had brought too much back, and she hadn't been sleeping well. Flashes of the past and nightmares had started to pass through her mind as she slept again. She shook her head lightly, she didn't want to talk. Very few people, if anyone would be able to draw her from her current mood. Instead she pulled out her violin and began to play. The music swirling around her and taking her mind off of anything other than the music. Her eyes remained closed as she let the music be the only thing in her mind. As the music continued she became completely wrapped up in it. She knew if the nightmares got bad again, she knew how to face them if she needed. Her fingers danced over the frets as the bow moved effortlessly across the strings. Her stormy eyes closed as her chin rested on the instrument. The breeze flitted through her feathers peacefully. "yami strolled through the mountains humming peacefully when he heard the sound of a violin. yami followed the sound until he reached the mountain top. finally finding who was playing the music he smiled and his shadow formed into a flute and he followed her lead"
Mika's eyes fluttered open slightly hearing the new sound interwove with her Violin. She gave a soft smile as she picked the the tempo of the music as he joined. Kurei was flying in the sky, searching for a calm spot to works on freeing the blocks and to see if there a good spot to take a nap. Thanks to Kaya's knowledge, he had a new hope. He heard a familiar violin and a new sound mixing together, yet the music is something he haven't heard in a long time, he had little experiences with music so when heard it, he wanted to sleep a bit. Above the mountain's top, he float in the sky with his front up in sky, closing his eyes, his wings flaps softly to keep him in air as it grew to phoenix's adult size. He float there, listening to the musics that soothe his and Rei's minds. "This is... nice." Rei comment, taking a break from working on one of many blocks, Kurei nodded back. Although he float and not on ground, his shadows cast onto the mountain's top. "yami smiled back as mika acknowledged his presence, yamis shadow became an orchestra that followed the music too. 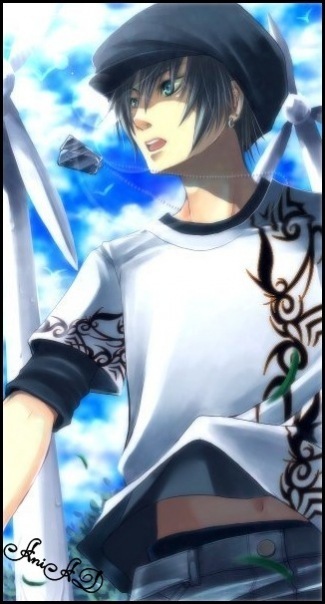 yami continued playing his shadow flute and smiled up at kurei in the sky"
Stormy eyes closed in concentration at they neared the complex violin parts of the music. She had smiled at Yami, and had sensed the other presence, but she was completely immersed in the music that swirled around them. Peaceful and serene, yet concentrated, the moonlight bounced softly of her face and the instrument. She would be lost to the world until the music finished. "yami jumped into the air, replacing him where he were was a shadow copy of him playing the flute. yami landed on a shadow stage with a pointer and music sheet in front of him. yami ocnducted the music. waving his hands at the different sections, the percussions, the strings, and so on. as the violin part came yami conducted the orchestra to play lightly so that the violin would be soloed out"
Mika smiled softly as her eyes remained closed. She could feel the music, feel the tempo. She could hear the orchestra playing to her musical strengths. The bow moved swift and sure across the strings, her fingers danced along the frets. The wind blew about around her, blowing through her hair and feathers. The violin was more of an extension of herself than just an instrument. "yami smiled and allowed the orchestra to join back in with his shadow yami created a crowd of people around the high rock mika was on. they began waltzing around the rock"
Mika opened her eyes lightly to see the scene in front of her. The waltzing shadows made her smile. Her bow slowed as the tempo did, her eyes falling on yami with a soft smile. Kurei's smiles plays on his face as he float in sky way above the mountain top, his black feathers float down around, dancing in air around the mountain's top, his 9 blades come out and dances around in air as he listens the musics down below. "yami smiled back and looked up at the weird scene of the guy dancing with swords and laughed. yami bowed gentlemen like to mika"
Mika's eyes glanced up to see the scene above her, before she curtsied to yami as she finished the song she was playing. "I think the blades like musics, they never done something like this until recently. Wonder if they got their own aura..." Rei said in his mind as he watches the blades dances, liking that even the blades listens. It was strange, but happy. Kurei nodded in his mind back, his eyes was close though but he can feel his blades dancing and listen to the music. "as the song ended the dancers curtsied and bowed to each other before turning to the rock and applauding mika. some began to throw shadow roses to her. yami applauded also and threw a bouquet of shadow roses"